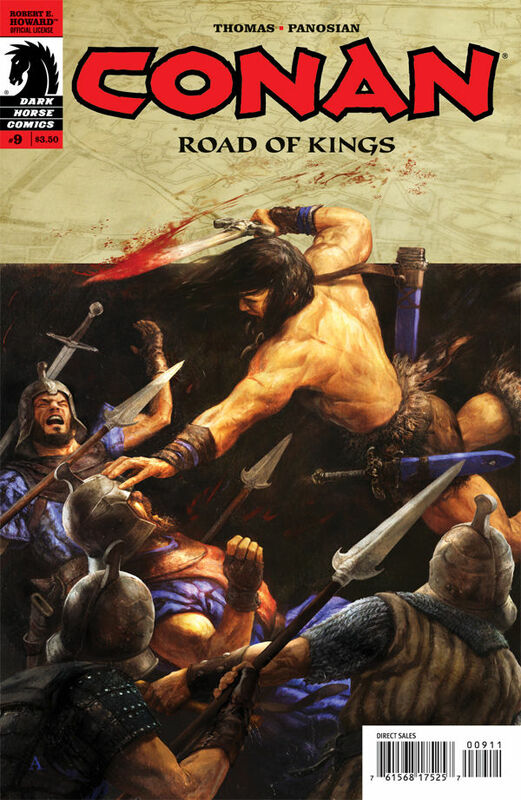 The Last issue Conan and Albiona reunite’s with her mother Thelitis and the other conspirators—inside the catacombs they get attacked by an army of undead soldiers the Aquilonians buried centuries ago..
From the start, Conan and the others are fighting what seems like an endless battle with the undead. As they make way through the first wave of them, a second wave follows, which cause’s Arpello to frantically run away in fear. Conan and the other’s start to wonder if maybe sorcerery is playing a hand, with fatigue setting in the end looks near—when Conan furiously cuts one in half, that’s when they find out that magic isn’t at work. But parasites which have inhabited the bodies of the dead soldiers gives Conan, Prospero and J’honn a new-found vitality of strength which cuts short when Arpello runs into is own set of problems. Roy Thomas’s writing is spot on, I’m not surprised since he’s been doing Conan stories for a while now, he does a fantastic job binding comedic dialogue within action sequences. His formula works and I can’t see anyone else writing and nailing it like he does. I thought Mike Hawthorne’s art work was a perfect fit until I saw Dan Panosian art in this issue, there is no significant drop in the work. In fact, you probably couldn’t tell the difference between the two artists. I commend Panosian for not altering or changing the artwork in any way, the colorist Dan Jackson does a solid job once again and Aleksi Briclot’s cover art is always stunning. Kohta Hirano is back again, this time with a new foundation for war unlike any other in Drifters, a manga which combines destined time travelers with a fairy-tale world. In it, a war is brewing against the Black King, a figure determined to wipe the drifters from his realm with his own army. O-Toyohisa, Nobunaga and Yoichi have only one choice to engage this new world with all their might and discover why fate has brought them from their respective eras into this troubled world. With that said, Drifters will take many readers right into the pages of Hellsing in the art style, it reflects heavily to the world that Hirano developed over those years. While Alucard hasn’t jumped into the fray, some of the characters just feel like old friends in their actions and design. The raw force of O-Toyohisa is scary but relentless, seeking only the strongest of his opponents to savor the battle, even Yoichi strikes a tones of former female leads. For those that fell in love with giant guns and epic battles of blood, there is no shortage of that in this world, I would say that it’s just as strong as ever in this first volume. As for taking on new classes and breeds of character, Hirano has no issue establishing his creative power over these new figures and presents them in equal care to the central figures of the story. For those worried about a slow start to this tale, worry not. The action paces itself throughout the volume, making sure to include only enough to keep readers moving quickly through the event until the next transition hits. Shortly into the manga there are some mysteries revealed to tease the reader about what this whole war is about, to save on spoilers though I’ll avoid talking about it. Just keep in mind that this isn’t a simple dark Shonen story and it seems as if we’ll have many turns ahead in this new world. 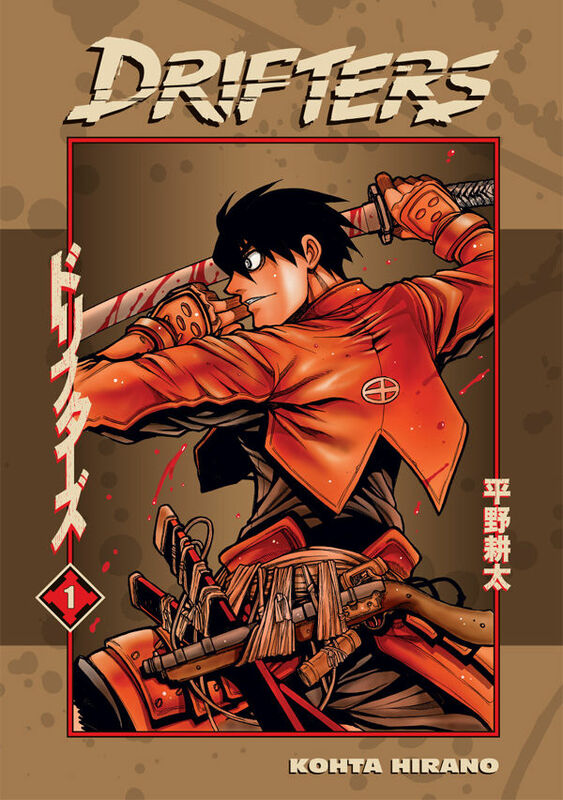 For Hellsing fans, this is a series to seriously consider jumping into; for manga fans looking to break from simple Shonen titles… I would say this is a strong contender for your money. The length, development and potential makes it one that collectors will most likely chase down after the next few volumes hit the streets.